A cultural hub, Bangkok is home to innumerable temples, shopping malls and street hawkers alike. Use Cleartrip to plan your holiday to this popular tourist destination in Thailand, and fully immerse yourself in the excitement and adventure. You may select either All Nippon Airways, Thai Airways, Etihad Airways, Korean Air Lines, Vietnam Airlines, Jet Airways, Air India, SpiceJet, Bangkok Airways, and Sunstate Airlines while flying from New Delhi to Bangkok. 73 flights frequent this route weekly. Of these, All Nippon Airways, Thai Airways, Etihad Airways, Korean Air Lines, Vietnam Airlines, Jet Airways, Air India, SpiceJet, Bangkok Airways, and Sunstate Airlines. The first flight from New Delhi to Bangkok is All Nippon Airways, departing at 12:15 AM. The last flight from New Delhi is Sunstate Airlines, which leaves at 11:15 PM. A non-stop flight on this route is 4 hours 15 minutes long, but connecting flights with multiple halts might take more up to 43 hours for the same. The time difference between these two cities is 1 hour and 30 minutes. Local Bangkok time falls in the GMT +7 zone. It is significantly cheaper to fly round trip than buy one-way tickets for this route. In order to secure the best seats and your preferred time of travel, all international tickets must be booked 90 days in advance. Bangkok has two airports - The Don Mueang International Airport (DMK), and Suvarnabhumi (BKK). However, Suvarnabhumi Airport is the primary international airport, operating with one passenger terminal. 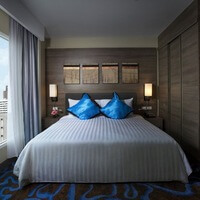 It is located 25 kilometers away from downtown Bangkok. Your flight might land at either airport, so it is essential that you check the details of your flight. The Bangkok Airport has a lounge room with a television, as well as other entertainment and relaxation options for passengers, as they await boarding. The IATA code of the airport in New Delhi, called the Indira Gandhi International Airport, is DEL. It has two active terminals for passengers. For senior citizens, women traveling with children, and passengers with reduced mobility, buggy services are available across the airport. While in Bangkok, you may explore the city canals, or pray at a Thai temple. Notable attractions one absolutely should not miss include The Grand Palace, Chao Praya River, and Terminal 21. Use Cleartrip to have a single source of all travel information. Download the Cleartrip app to book flights in 60 seconds on the go. You may also check your PNR status on the Cleartrip app. Use Cleartrip to truly relax, and enjoy your travel. Is it true that takes less time on a direct New Delhi to Bangkok flight than other airlines? Will I be served alcohol on a New Delhi to Bangkok flight? What is the average range of Economy class tariffs on New Delhi to Bangkok flight route? The Economy class airfare ranges from Rs. 0 to Rs. 0. All Nippon Airways, Thai Airways, Etihad Airways, Korean Air Lines, Vietnam Airlines, Jet Airways, Air India, SpiceJet, Bangkok Airways, and Sunstate Airlines provide tickets in this range. Is there web check-in option available with New Delhi to Bangkok flight? Yes, passenger do get a web check-in option with their New Delhi to Bangkok flight via online web check-in or airport check-in.